Although the market economy is not as unpopular now as when Acton wrote The Morals of Markets, the morality of buying and selling has long bothered man’s conscience. Defenses of capitalism often establish its efficiency or rely on a “that is the way human nature is anyway” argument. This book asserts that a free market is a necessary condition for the pursuit of moral excellence. Its analysis of the relation between capitalism and moral virtue has not been superseded. The demise of Marxism and the moral bankruptcy of socialism throughout the world do not end the debate over capitalism. 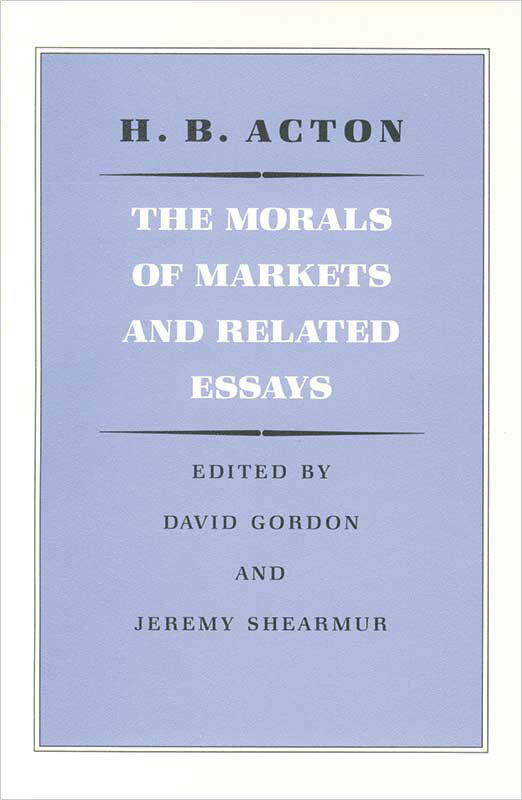 Acton’s book is distinctive in discussing the “morals of markets” in a way that forms an essential addition—often missing—to the case to be made for free markets. Harry Burrows Acton (1908–1974) was Professor of Moral Philosophy at the University of Edinburgh. Jeremy Shearmur teaches political theory at the Australian National University. Foreword, introduction, editors' note, selected bibliography, index.